Eveline Lubbers is a Research Fellow at the University of Bath, and an independent investigator with SpinWatch. She is the author of Secret Manoeuvres in the Dark, Corporate and Police spying on Activists (Pluto, 2012) and the initiator & contributing editor of Battling Big Business: Countering Greenwash, Front Groups and Other Forms of Corporate Bullying (2002). Her writing up to 2005 is collected at evel.org. Eveline Lubbers is an investigator, a civil rights advocate and an academic living in Amsterdam. After finishing university (political sciences) in 1984 she co-founded the Jansen & Janssen bureau, a small civil rights organisation that monitors the activity of the police and secret services and supports social groups against oppressive surveillance tactics of authorities. She has published in both campaigning and mainstream media, on the Internet, and has edited books on related subjects, mainly in Dutch. Eveline went back to university in 2005 for a PhD project at the University of Strathclyde. She edited her thesis (2010) into a book called Secret Manoeuvres in the Dark, corporate and police spying on activists, published by Pluto Press (2012). She has been a research fellow at the University of Bath Department for Health since early 2011, and taught investigative reporting to master students at the Vrije Universiteit in Amsterdam. In 2007, she coached investigative journalists in several African countries in a transnational project for the Forum for African Investigative Reporters (FAIR). In the past decade, Eveline has specialised in corporate intelligence and the public relations-strategies of multinational companies against their critics including internet-activists. This resulted in developing the concept of her book, titled Battling Big Business, countering greenwash, front groups and other forms of corporate bullying (2002). The book has been translated into Dutch and French. This project included collaboration with international authors, with Eveline acting as chief editor and author. She continued research in this field as a freelance writer and an academic while at the same time setting up SpinWatch.org in the UK. Her PhD-thesis (2010) was called Activist intelligence and covert corporate strategy and focused on corporate spying on critical activists (available on CDrom at request). Edited into a book for a general audience, it was published for Pluto Press in the summer of 2012. At present, Eveline is a research fellow at the University of Bath, a job shared with Andy Rowell. For the Tobacco Control Research Group they developed a cutting-edge online resource to monitor the tobacco industry’s political activity called TobaccoTactics.org. The website explores how the industry influences and often distorts public health debates, using a whole raft of lobbying and public relations. The use of a wiki-based database as a model of knowledge exchange public health advocates, journalists and policy makers, was a first for the University of Bath. Her current research into secret manoeuvres includes investigating the opportunities to establish a permanent residence for her project. 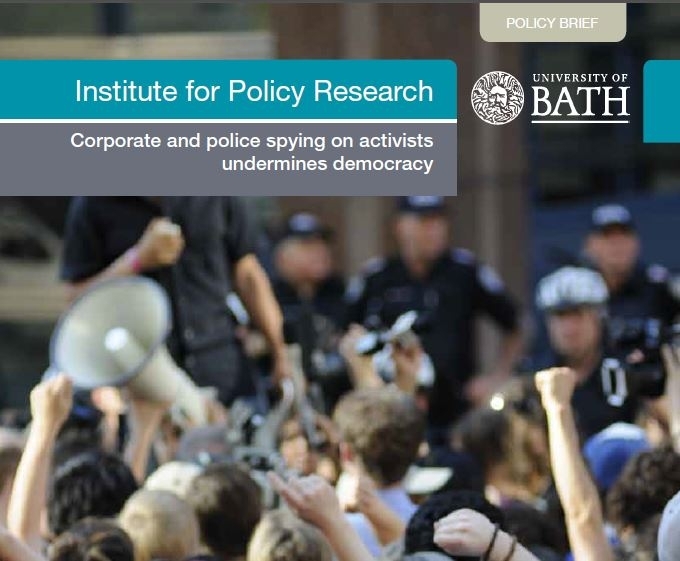 Organising publicity around Secret Manoeuvres offers the opportunity to reach out and get in touch with people interested in bringing the research into corporate and police spying to the next level.